Edwin H. Colbert (Wikimedia Commons). 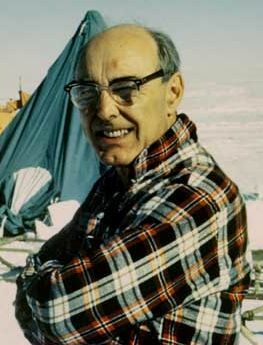 During his long life, Edwin H. Colbert made his share of major fossil discoveries; he was in charge of the team that unearthed a dozen Coelophysis skeletons at Ghost Ranch, New Mexico, in 1947, and he also named Staurikosaurus, one of the earliest known dinosaurs of the late Triassic period. For 40 years, Colbert was a curator at the American Museum of Natural History in New York, where his mentor was the distinguished fossil hunter Henry Fairfield Osborn, and he wrote a series of popular books (including 1945's seminal The Dinosaur Book: The Ruling Reptiles and Their Relatives) that helped introduce baby-boomer kids to paleontology. When he was already past 60, Colbert accepted a post as curator of vertebrate paleontology at the Museum of Northern Arizona. Today, aside from Coelophysis, Colbert is best known for his 1969 discovery of the skeleton of an early therapsid, or "mammal-like reptile," Lystrosaurus, in Antarctica. Before Colbert's expedition, various Lystrosaurus fossils had been unearthed in South Africa, and paleontologists had come to the conclusion that this creature couldn't possibly have been a good swimmer. Colbert's discovery proved that Antarctica and South Africa had once been joined in a single southern continent, Gondwana, thus lending support to the theory of continental drift (that is, that the earth’s continents have slowly been joining, separating, and moving around over the last 500 million years or so).